In our rapidly changing world of social media, everyday people are more and more able to sort themselves into social groups based on finer and finer criteria. In the near future of Robert Charles Wilson's The Affinities, this process is supercharged by new analytic technologies: genetic, brain-mapping, behavioral. To join one of the twenty-two Affinities is to change one's life. It's like family, and more than family. Your fellow members aren't just like you, and they aren't just people who are likely to like you. They're also the people with whom you can best cooperate in all areas of life, creative, interpersonal, even financial. The Affinities in a nutshell? Divergent targeted to adult readers. Both books are based on the idea that humanity is encompassed in a finite number of personality profiles and therefore can be sorted into trait-based communities. In our modern world where we crave for belonging, and when groups, clubs and the sort thrive on the Internet, it feels like a natural question to ask: would we be happier if we could just be directed to people who think the same way we do? And how would this affect our customs and our society? In this respect, The Affinities explores a very relevant, very present-day issue. It takes place in a contemporary setting (unlike Divergent, which happens in a dystopian society) which makes it much easier to identify with. The science-fiction aspect is limited to the technology that “diagnoses” an individual and defines in which community—called “affinity”—he or she belongs. 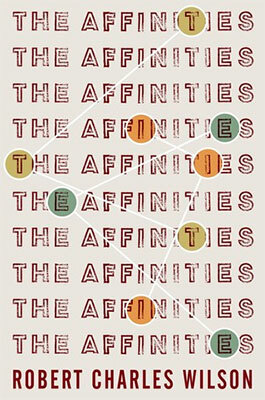 All in all, The Affinities is a very accessible novel, very easy to get into. However, though its premise felt very endearing, the story fell short of my expectations. First, The Affinities appeared very nearsighted to me. It’s based on a large-scale idea: a technology that would affect everyone, would deeply redefined friendship and social interactions, and would ultimately shake the foundations of society. In the book, there are twenty-two affinities and the technology is spreading world-wide. However, we essentially follow one character: Adam Fisk, a young man with no friend to speak of, and virtually estranged from his family. Craving meaningful social interaction, he decides to undergo the affinity test and get assigned to the most populated affinity: Tau. This sets hard boundaries to the story: we’re stuck with Adam and the Tau community. While we get to know a bit more about Het, the second most successful affinity and hence its direct competitor, the twenty other affinities are simply ignored. We don’t know what they do or what characterize them, as if they were irrelevant. Also, the story being so focused on Adam, it’s difficult to comprehend the actual impact of the affinities on everyday life. Second, the plot was predictable and somewhat simplistic. Basically, the Tau affinity is depicted as the nice side, where people share their belonging, always take concerted decisions, cooperate very well, and are tolerant regarding sexual orientation and drug consumption. On the other side, the Het community is depicted as extremely hierarchical, sly and brutal. Collaboration and tolerance on one side, violence and merciless structure on the other. So cliché. Also, as soon as you understand what the affinities are, you know where the book is heading: struggle for power. No surprise, no particular insight. Finally, the ending was a massive disappointment. Thirty pages before the last, I started to wonder how Robert Charles Wilson could bring closure to the plot in so few pages, and if The Affinities would actually be the first opus of a series. It’s not: the novel does end, but it does it in a rushed, uninspired and abrupt way. Nonetheless, I should mention for good measure that The Affinities is a rather well executed, well paced, entertaining fiction. It’s this type of easy, pleasing evening read that will relax your mind just like a good but not particularly demanding Hollywood movie. Actually, I wouldn’t be surprised if The Affinities ended up in the movie theatres since its story arc, narrative pace and plethora of action would fit the big screen quite well. All in all, The Affinities is a decently entertaining and relaxing read: the plot is intriguing, the narration is certainly well paced, the characters are rather likeable and the story manages to retain the interest of the reader. However, it won’t bring any surprise or insight on the subject of the personality-based communities. It’s very predictable and the end seems hurriedly wrapped up. I suspect this book would be more enjoyable to readers who haven’t read similarly themed stories. However, fans of faction-based plot will surely enjoy it too.